It’s been a huge year for custom motorcycles. They’re back with a bang, and the mainstream media has noticed. Even the Financial Times has picked up on the resurgence, reporting on The Comeback of the Cafe Racer. And most of the biggest-selling motorcycle magazines have added ‘new wave’ customs into the monthly editorial mix. Manufacturers are getting in on the game too. Yamaha Europe is working closely with builders such as Deus, the Wrenchmonkees and Kedo. And BMW has enlisted the services of Roland Sands, El Solitario, Blitz and Urban Motor. It’s great news for motorcycling in general, and not just the custom scene: Bikes that are simple and fun and easy to personalize are making their way into the showrooms, such as Moto Guzzi’s extended V7 range and now Yamaha’s reborn SR400. So let’s take a look back at 2013, and pick out the motorcycles that were the biggest hits on Bike EXIF. As always, we look at traffic figures, social media shares, comments and the number of incoming links. We balance this with the age of the post, so that more recent machines are not disadvantaged. 1. 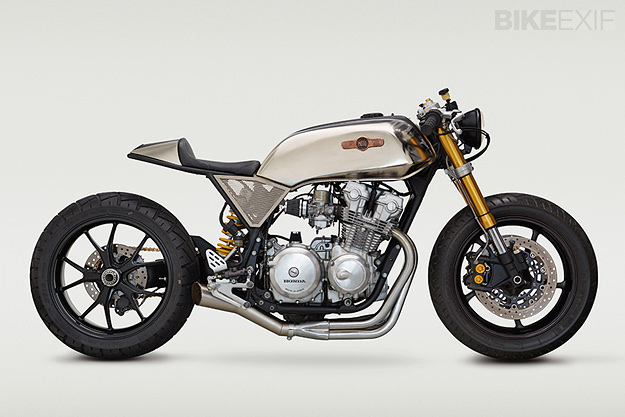 Honda CB cafe racer by Classified Moto [top]. For the second time in a row, a Classified Moto bike has taken the top spot. It seems like John Ryland can do no wrong, with a distinctive aesthetic all of his own and a burgeoning order book. 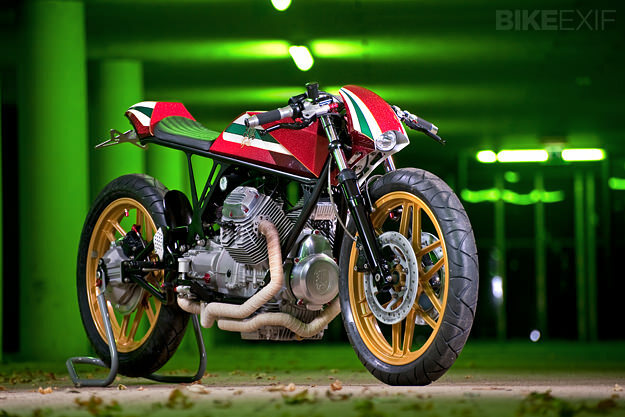 ‘Superstrada’ is a heavily customized 1980 Honda CB750F Super Sport, with a Yamaha YZF-R6 front end, Classified Moto’s signature triple tree conversion, and a single-sided Ducati swingarm. 2. 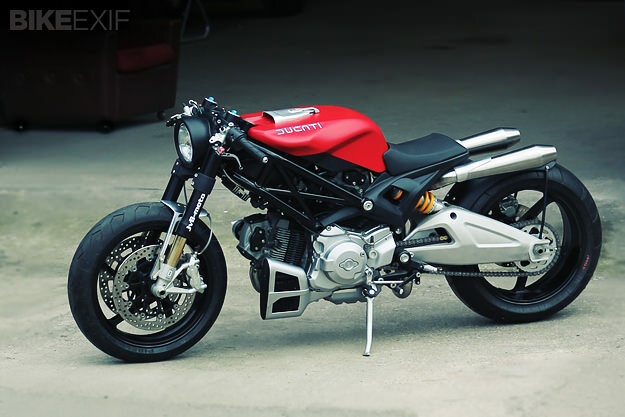 Ducati Monster 1100 by JvB-Moto [above]. Ten years ago, Jens vom Brauck won Ducati’s International Design Contest with a retro-futuristic concept called ‘Flat Red.’ He’s now an established builder with a string of stark, brutal-looking machines to his name. At the Glemseck 101 festival in Germany, Jens revealed Flat Red II—and set the interwebs alight. 3. 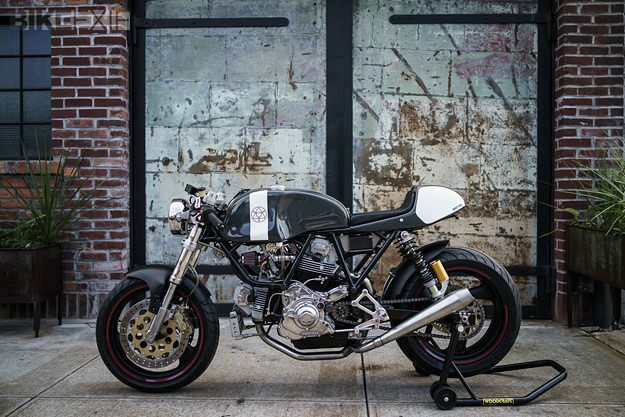 Ducati 900 by Walt Siegl [above]. To move beyond bolt-on parts takes hours of craftsmanship, and true artisans don’t come cheap. Walt Siegl has taken a big step to correct the imbalance with his new Leggero Series, a limited run of production machines based on two-valve Ducati 900cc engines. This is the prototype: you can now order one for yourself. 4. Honda CX500 by Mateusz Stankiewicz [above]. The CX500 is a tough and reliable bike, and still cheap on the secondhand market. This 1982-model custom, built by a Warsaw photographer and the garage Eastern Spirit, was the surprise hit of the year—and made it onto the cover of the 2014 Bike EXIF wall calendar. 5. 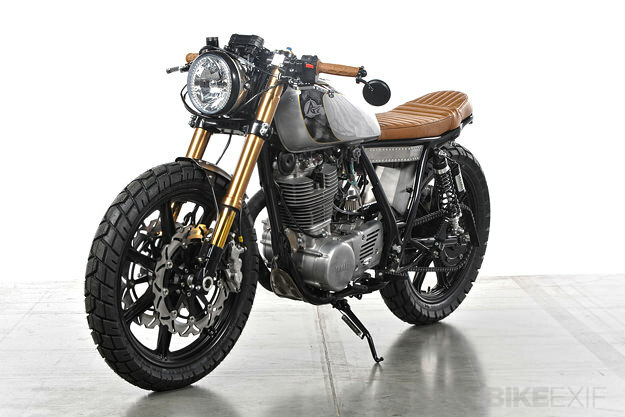 Yamaha SR500 by Analog Motorcycles [above]. Tony Prust builds elegant, mid-capacity customs: the perfect bikes for barhopping and cruising around town. This 1979 Yamaha SR500 has more of a raw edge though, and a name to match—‘Bruto.’ It’s a machine for evening and weekend rides, with a seat big enough for two. 6. Kawasaki W650 by Skuddesign [above]. Nicolas Barthelemy got the blend of drop-dead gorgeous looks and practicality just right for this Kawasaki. “I wanted to mix aesthetic codes—bobber, brat style and street tracker—to create a motorcycle that corresponds to my world,” he says. The bike is now one of the stars of our best-selling book, The Ride: New Custom Motorcycles and Their Builders. 7. 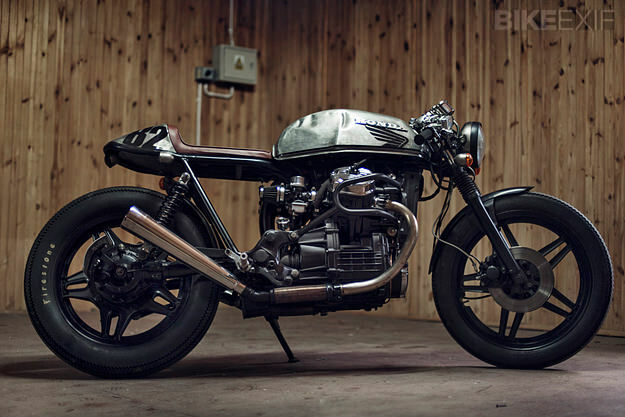 Moto Guzzi V50 by Rno Cycles [above]. Think of a custom Moto Guzzi, and it’s invariably built in the ‘classic’ style: Timeless café racer lines, muted colors and bare metal. So it’s refreshing to see someone take a completely different approach—and pull it off spectacularly. This rapier-sharp V50 is called ‘Opal’ and comes from Arno Overweel of The Netherlands. 8. Harley dual sport by Carducci [above]. 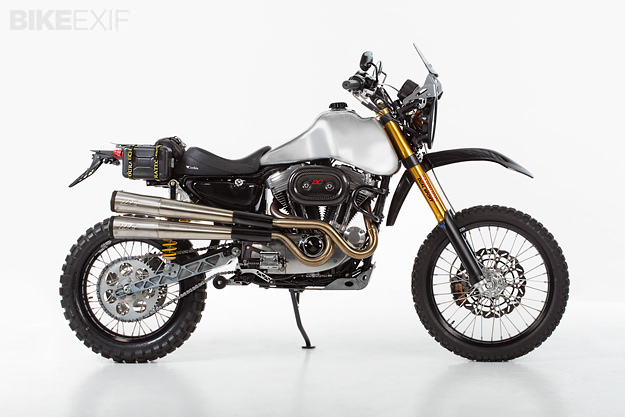 A Harley Sportster-based dual sport bike? It might sound improbable, but engineer Jim Carducci has built just such a beast. And with a torquey, reliable motor plus 8+ inches of rear wheel travel and 10+ inches of front wheel travel, it actually works. 9. 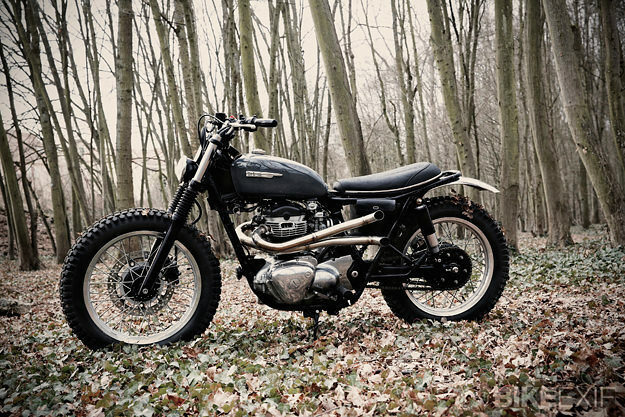 Triumph Bonneville by MeanMachines [above]. 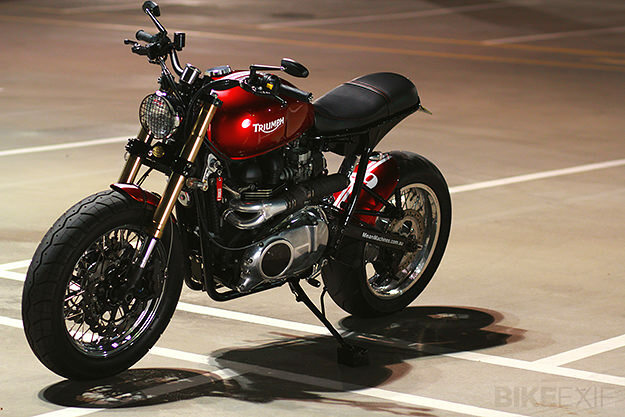 This Triumph Bonneville looks like it’s poised to shred rubber, even when it’s standing still. It’s the work of MeanMachines, an Australian shop very familiar to local owners of Bonnevilles and Thruxtons. Builder Wenley Ng has been modifying Triumph ‘modern classics’ for many years now, but fitting that 200-section rear tire was still a challenge. 10. BMW R100RT by Bill Costello [above]. 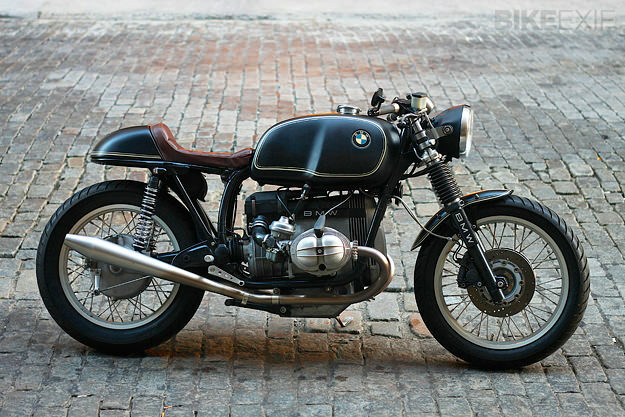 There were cries of outrage when Bill’s R100RT was omitted from our recent Top 5 BMW R-series piece. Bill made his name with an R50 custom that caught the attention of BMW’s top brass in Germany, but this time he wanted a reliable daily rider. He’s also put the bike on a diet, dropping the wet weight from around 525 lbs to 430. A handful of machines narrowly missed the cut, including the Sprintbeemer, Valen Zhou’s remarkable Honda CB125 and Café Racer Dreams’ NX650. Indeed, if you aggregate all of CRD’s builds, the Spanish company would join Classified Moto, Deus and Rough Crafts as the biggest traffic sources for Bike EXIF. So that’s our round-up for 2013. With almost 25 million pageviews, 270,000 Facebook fans and over two million followers on Pinterest, we’ve had a good year. We hope yours has been good too. Thank you for joining us, and here’s to a 2014 filled with many more exciting bikes.